As we’ve discovered before, the Little Things are what draw you in, and they’re what makes the show irresistible and unforgettable. But what happens when concert fans get transfixed by a one-man band street performer, and others artists like Girl Talk, Andrew Bird or TuNeYards who are pushing the art forward in the 21st century. We’ll explore those three artists in a moment, but first, let me share with you a fantastic encounter I had with a one-man band who put on a virtual Little Things clinic on the streets of Michigan. 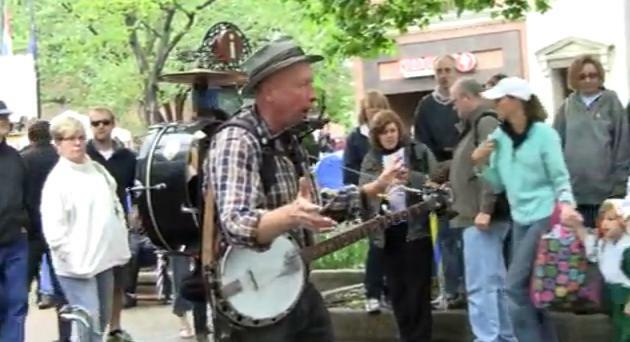 Above is a video of Detroit-based street performing one-man band Joseph O’Keefe as he pays tribute the real Jesse James (not the Sandra Bullock one), masters the art of the stop spot pause, and relies on fans to help him tune his cow bell — while playing live in Holland, Michigan during the Tulip Festival. If you’ve never had the pleasure of seeing a one-man band artist before, I hope you do sometime soon, because it is really something amazing to see. And what I love about O’Keefe’s take on the multi-tasking solo rocker, is the way he entertained and interacted with the Holland crowd. There was a big parade going by while he was playing, but most eyes and ears were glued to O’Keefe because he was way more fun to watch that floating balloons and vintage cars cruising by at 5mph. O’Keefe won me over the instant I saw him jamming on the street. I quickly flipped on my camera and watched as he rambled through the classic folk tunes and told funny stories with the kids in the front row. And within just a few minutes, I couldn’t help but toss some cash in his tip bucket. I’ve been excited to share this video with you too because when you watch the video closely, you see just how amazing what he is doing really is. Each of his feet are connected to straps so he can play the cymbal/hi-hat and the bass drum by moving his feet. The end of his guitar is attached to the cowbell (which a fan kindly helps him re-tune) and he’s wails on the harmonica while plucking his banjo and singing all at the same time. AND he’s got the crowd interaction down pat as he tosses humor and quick jokes into his act. Watching O’Keefe got me thinking about other Little Things I’ve notice during some of my favorite concert adventures. First, I thought of how technology has created a new 21st century version of the one-man band with the advent of the laptop artist. Yes, DJs have been around for years, but when I think of guys like Girl Talk, I can’t help but think how he’s a great example of a new breed of the one-man band with in his genre. Who else would you put on the list? You can also look at artists like Andrew Bird and or Merrill Garbus of TuNeYards to see how they’ve mastered the art of the loop machine — among other live instrumentation and orchestration — to create mesmerizing sonic tapestries, and get the most out of their own one-man(or woman is Merrill’s case) band creativity. And the other thing I’ve been thinking about after seeing O’Keefe is the level of captivation that I had while I watched him. There was so much going on in such a small space and it was all being done by one person. And the reason I think I was so amazed is that I’m used to seeing five or six band members do what O’Keefe did all by himself. What a show it was. And I know I’ll be thinking about it during my next concert. Think back to your favorite concert. And tell me…. How did they captivate you during the show? Was is it with their playing, or do they mesmerize you with their words, or how they move their body during the show? Were you so transfixed during the show that everything and everyone around you seem to fade away? Special Note and Request for Help: Unfortunately, I didn’t have the change to talk with O’Keefe that day and I have since tried to connect with him, but have been unsuccessful finding his outposts online. I would really love to share this post with him and invite him on our Live Fix Podcast, so if you know Joe (or are Joe) please drop a comment and let us know how we can get in touch with him. Thank you very much for any info!